The Audi A5 is a series of compact executive coupe cars produced by the German automobile manufacturer Audi since March 2007. The A5 range additionally comprises the coupe, cabriolet, and "Sportback" (a four door features a fastback like roofline with a steeply raked rear window with integrated trunk lid) version of the Audi A4 saloon and estate models. Under Audi's internal platform numbering convention, the A5 is a member of the B-platform series of vehicles, sharing its platform designation with the A4 saloon and Avant. The first generation A5 (Type 8T) is therefore a member of the B8 family, whilst the second generation model (Type 8W6) is based on the B9. Both are derived from the Volkswagen MLB (Modular Longitudinal Matrix) architecture. The A5 marked Audi's return to the compact executive coupé market since the (B3/B4) Audi 80 based coupé model ended production in 1996. On May 10, 2006, Audi confirmed that the A5 would go into production. The B6/B7 A4 spawned a convertible variant but not a coupé. For the fourth generation A4 (B8), Audi decided to spin off the cabriolet, along with a new coupé and 4-door sportback sedan, into a nameplate of its own as the A5. The A5 was the first of the B8 family of vehicles to be released (the others being the A4 and the Q5 crossover SUV), all based on the Audi MLP platform (Modular Longitudinal Platform) which underpin the next generation A6 and A8. The A5 is the third coupé in Audi's line up, following the second generation TT and the R8. The A5 adopted design elements of the Nuvolari quattro concept car. The A5 debuted with the 3.2 litre FSI V6 engine delivering 195 kW (265 PS; 261 hp). The design was based on the Nuvolari quattro concept car. Both the Audi A5 and the S5 Coupé models were unveiled simultaneously at the Salon International de l'Auto (Geneva) and Melbourne International Motor Shows on March 6, 2007. Ordering of the A5 and S5 began on March 6, 2007 and the first deliveries were made in June 2007. Launch models included 3.2 FSI V6 engine multitronic and 3.0 TDI quattro 6-speed, with 1.8 TFSI available in autumn 2007. Early U.S. models included the A5 3.2 FSI quattro and the S5 coupé 4.2 FSI quattro. Both included either a six speed manual or six speed Tiptronic automatic transmission. The S5 model went on sale in November 2007, equipped only with a manual transmission, while the A5 and the Tiptronic went on sale beginning of spring 2008. Canadian models went on sale in 2008. Launch models included A5 3.2 FSI with choice of six speed manual or six speed Tiptronic transmission. Since 2011, only the 2.0 L Turbo engines are available for the A5 in Canada. In 2013 Audi introduced the new A5 Black Edition. Both the Audi A5 and the S5 Cabriolet (convertible/cabriolet) production began in the beginning of 2009. The A5 Cabriolet included a fabric roof as opposed to a retractable hardtop as on the Volkswagen Eos. The engine ranges are same as contemporary A5 coupé models, but S5 Cabriolet came with a 3.0 TFSI V6 supercharged engine. The A5 Cabriolet replaced the A4 Cabriolet. Delivery of A5 Cabriolet began in the second quarter of 2009. The vehicle was unveiled at the 2009 New York Auto Show. The U.S. versions of A5 and S5 Cabriolet went on sale in September 2009 as a 2010 model. Early models included A5 2.0 I4 TFSI multitronic, A5 2.0 quattro Tiptronic, S5 quattro S Tronic. The A5 Sportback has four frameless doors and a long, tapering fastback like roofline, giving it a "four door coupé like" appearance. While it shares many exterior cues with the A5 coupé, the Sportback's interior is similar to the A4 saloon; although all A5 models have same platform as the A4, the Sportback is closer in design to the A4 than the rest of the A5 family. The Sportback has been described as "a saloon with the front end (including an identical S-line look) and taillights of the A5 coupé but the wheelbase of the A4", with the Sportback positioned more as the "designer's car" compared to the more conventional A4 saloon. The Sportback model is available in Europe, Japan, South Korea, China, Australia, New Zealand, Middle East, Mexico, Argentina, and South Africa. Although not originally sold in the United States and Canada., the A5 Sportback entered the North American market as a 2018 model in the beginning of 2017. Early production models included 2.0 TFSI quattro 155 kW (211 PS; 208 hp), 3.2 FSI quattro, 2.0 TDI 125 kW (170 PS; 168 hp) with six speed manual gearbox and start/stop system, 2.7 TDI, 3.0 TDI quattro. Production versions went on sale in September 2009. The A5 Sportback is available with two petrol engines and three diesel engines. The Audi S5 was released in coupé form to the public at the same time as the A5. The Audi S5, in comparison to the A5, features a different fascia (as do most Audi S and RS models), including a string of LED daytime running lights around the bi Xenon headlamps and a vertically striped chrome grille. In many markets, the S5 includes as standard, 19-inch alloy wheels with a five parallel spoke design, bigger brakes, heated leather sport seats, and other convenience features, some of which are available only as an option on the A5. Changes for 2010 model year include LED tail lamps, the introduction of Premium Plus and Prestige trim levels, and new optional equipment such as Leather/Alcantara seats. Despite sharing the same nameplate, the powertrains were different between the coupé and the Cabriolet/Sportback for the 2010–12 model years. The 2010–12 Audi S5 coupé had a 4.2 litre fuel stratified injection (FSI) V8 engine that produces 260 kW (349 hp), while the S5 Cabriolet and Sportback have a supercharged 3.0 litre TFSI V6 engine producing 245 kW (329 hp) which is shared with the 2010 Audi S4 3.0 TFSI quattro sedan and avant. The coupé had a choice of either a six speed manual or six speed Tiptronic, while the Cabriolet/Sportback has the seven speed S-tronic dual clutch transmission. The Aluminium A5 Coupé is a prototype vehicle demonstrating the aluminium Audi Space Frame (ASF) concept. It is based on Audi A5 Coupé 2.0 TFSI with 155 kW (211 PS; 208 hp) engine, but it uses the aluminium Audi Space Frame, aluminium and carbon fibre-reinforced plastics body. Punch riveting, bonding or laser-MIG hybrid welding replaced spot welding. The vehicle is 110 kg (243 lb) lighter than the equivalent steel-bodied production model. The vehicle was built by Audi's Aluminium and Lightweight Design Centre in Neckarsulm. Available in coupé body, the RS5 features a 4.2 FSI engine rated at 450 PS (331 kW; 444 hp) at 8250 rpm and 430 N⋅m (317.15 lb⋅ft) at 4000-6000 rpm, coupled with a seven-speed S tronic transmission and quattro permanent all-wheel drive with crown-gear centre differential and electronic torque vectoring. It has 19 inch alloy wheels in an exclusive five arm structure design with 275/35 tires (optional 19 inch winter wheels), 365 mm (14.37 in) diameter ventilated aluminum front brake discs (optional 380 mm (14.96 in) diameter carbon ceramic front brake discs), aluminum 8 piston brake calipers with RS logos in high-gloss black, electronic stabilization program with integrated sport mode, speed dependent servotronic steering, Audi drive select with three (4 with MMI navigation system) modes of operation (comfort, auto, and dynamic, optional custom), and optional dynamic steering. Aesthetically, the RS5 features a single-frame grille with a shiny charcoal gray rhombus pattern grid, Xenon plus headlights with a sweeping strip of LED daytime running lights, redesigned bumper tapers downward into a splitter, flared fenders inspired by Audi quattro, side sills with angular caps, trim strips with aluminum look on the single-frame grille and near the side windows and the outside mirrors; a choice of 8 body colours, two oval exhaust pipes integrated within the bumper, spoiler in the tailgate automatically extends at 120 km/h (75 mph) and retracts at 80 km/h (50 mph), extensively clad underbody integrating air vents for the seven speed S tronic and the front brakes. In the cockpit, the model has electrically adjustable sports seats in leather/Alcantara combination upholstery with side sections and integrated head restraints (optional bucket seats with more prominent contours and folding backrests, ventilated and luxuriously upholstered climate controlled comfort seats; optional seat upholstery featuring special leathers and colors as well as silver headlining), steering wheel upholstered in perforated leather, black gauges with white lettering and distinctive scaling, driver information system with integrated lap timer and an oil-temperature gauge, black interior with decorative inlays made of carbon fiber (optional dark stainless-steel mesh, black piano finish or brushed aluminum inlay), instrument panel fascia in piano finish, pedals, footrests, optional MMI navigation systems' control buttons in aluminum; door handles with two slim strips, aluminum inserts at door sill trims and RS 5 logos, optional suede-covered controls and floor mats bearing RS 5 logos, sport exhaust system with a sound flap and black tailpipe trims. A Carbon design package is available for the engine compartment and for the vehicle body. Styling packages includes black or matt aluminum look. The RS5 weighs 1,800 kg (3,968 lb), with 56.3 percent at the front and 43.7 in the rear which makes it prone to understeer, however Audi has added two electro-mechanical systems to counter its nose-heaviness. The stability-control system attempts to stop front-end plow before it happens by squeezing the brakes on the inside wheels which effectively drag those tires enough to pull the car into the corner. The RS5 also has an active rear differential that can apportion power between the rear wheels to create a similar effect, or even oversteer; in normal conditions, quattro all wheel drive delivers 60% of the engine’s torque rearward and rising to as much as 85 percent depending on conditions. According to Quattro GmbH chief Stephan Reil, the 4.2 FSI engine is based upon Audi's 5.2 FSI V10 engine (found in the D3 Audi S8 and Audi R8) with two cylinders removed. The vehicle was unveiled at the 2010 Geneva Motor Show. Sales of the Audi RS5 began in spring 2010. It is a prototype designed for the Michelin Challenge Bibendum 2010 series. It includes a 2.0 TFSI engine rated 132 kW (179 PS; 177 hp) and 320 N⋅m (236 lbf⋅ft) torque, six-gear manual quattro drivetrain. It accelerates from 0–100 kilometres per hour (0–62 mph) in 6.9 seconds with top speed of 236 km/h (147 mph), and weighs 1,310 kg (2,888 lb). The car officially consumes 9.9 litres per 100 kilometres (29 mpg‑imp; 24 mpg‑US) when running on ethanol, but drivers managed 9.5 l/100 km (30 mpg‑imp; 25 mpg‑US) on ethanol during the Michelin Challenge Bibendum Rallye. It is a limited (125 units) version of 2012 S5 4.2 FSI quattro Coupé for the U.S. market, commemorating the end of Audi S5 4.2 FSI quattro production. It included Prestige Package, Daytona Grey body colour, 19-inch 5-spoke Rotor design wheels, a two-tone Polar Silver and Black S5 sport seats, silver contrast stitching on the seats, armrests, shifter and steering wheel; floor mats with a silver leather border, aluminum 'Audi exclusive' badges on door panels, carbon fiber beltline and a piano black instrument cluster. The vehicle was unveiled in 2012 Audi Club North America meeting at Infineon Raceway. In 2009, Audi announced the seven speed S Tronic transmission option for A5 with 2.0 TFSI quattro (155 kW) for the UK market, which replaced the six speed Tiptronic in the United Kingdom and Germany. Beginning with the 2011 model year, the A5 2.0 TFSI quattro coupé and cabriolet includes 8 speed Tiptronic transmission option, replacing the 6-speed Tiptronic in the U.S. and Canada markets. For the S5 3.0 TFSI quattro (245 kW), the manual transmission was discontinued for the European market. Titanium Package was introduced in 2011 model year of A5 Coupe, S5 Coupe sold in the U.S. The Audi A5 3.0 TDI won the Michelin Challenge Bibendum under the Prototypes category. The Ethanol E100 Coupé clinched overall victory in the Michelin Challenge Bibendum 2010 eco rally over a distance of 350 kilometres. The television adverts for the A5 Sportback used sound from Audi Sound Studio. The facelift vehicles, covering A5 Coupé, Convertible, Sportback, S and RS models, include updated front and rear lights, as well as a new front bumper design. The new front end includes pronounced air inlets, revamped grilles and flat fog lights. The vehicle is 10 millimetres (0.39 in) longer overall than the predecessor. Changes to S5 (available as Sportback, Coupé and Cabriolet) include the 3.0 TFSI (333PS) engines on all models, new lights, modified body details, new crystal effect paint finishes, quattro drive with the crown-gear center differential, electromechanical power steering. special S sport suspension, standard 18 inch wheels. The updated vehicles were unveiled at the 2011 Frankfurt Motor Show. Sales began in Europe in 2011 as 2012 model year vehicles. Early models include A5 1.8 TFSI, A5 2.0 TFSI, A5 3.0 TFSI, S5 3.0 TFSI, 2.0 TDI and 3.0 TDI. The base model is the Audi A5 Sportback 1.8 TFSI. United States models of A5, S5 went on sale as 2013 model year vehicles. Changes to the RS5 Coupé for 2012 included upgraded dampers and springs on the suspension front, new electric power steering replacing engine-driven hydraulic power steering, exclusive retractable rear spoiler, red cam covers and a carbon fibre intake manifold, optional piano black trim, twenty inch graphite coloured wheels, a sport exhaust system with black finishers. RS5 Coupé was unveiled at the 2011 Frankfurt Motor Show, followed by the 2012 Geneva Motor Show. U.S. models of RS5 Coupé went on sale as 2013 model year vehicles. Indian model of RS5 Coupé went on sale as 2013 model year vehicle for Rs 96.81 lakh (ex-showroom Delhi). The RS5 Cabriolet was unveiled at the 2012 Paris Motor Show. Production of the RS5 ended permanently in June 2015. A race version of the S5, the RS5 has a valved exhaust whose note can be tuned to suit driving conditions and personal preference. The RS5 has a heavy and naturally aspirated 4.2 V8 that produces 450 hp (336 kW). Deliveries of Audi RS5 Cabriolet began in the beginning of 2013 in Germany. U.S. model of Audi RS5 Cabriolet went on sale in April 2013 as 2013 model year vehicle. As part of the RS5 Cabriolet launch, Audi Land of quattro Alpen Tour 2013 featured a RS5 Cabriolet starting on September 23, travelling across twelve driving stages in 6 countries (Klagenfurt – the capital of Carinthia, Austria, Monaco). Codenamed R17, the Audi A5 DTM is a race car designed for the DTM beginning in year 2012, replacing the Audi A4 DTM. It includes a V8 engine rated at 340 kW (462 PS; 456 hp) with a 6-speed manual transmission (from previous A4 DTM car), pneumatically operated suspension using paddle shifters on the steering wheel, engine electronics (Bosch MS 5.1) and the central display from Audi R8 LMS, larger and wider tires from Hankook, 120-litre (26 imp gal; 32 US gal) safety fuel tank inside a carbon fiber cell, and a larger rear wing. The prototype was built by Audi Sport in Ingolstadt. The vehicle was unveiled at the 2011 International Motor Show (IAA) in Frankfurt. The homologation of the A5 DTM was scheduled for March 1, 2012. As part of the 2012 A5 launch in the United Kingdom, BBH London, Park Pictures, The Whitehouse and The Mill produced a television advert titled 'The Swan' (directed by Joachim Back), inspired by Hans Christian Andersen's tale of 'The Ugly Duckling'. The commercial featured black and white shots of the rebodied 1920 Audi concept car designed by Audi engineer Paul Jaray, trawling the streets of a sleepy Bavarian village, the streamlined model gets shunned by disapproving locals not taking too well to the new aerodynamic design. After retiring in a nearby forest, the 'ugly' car transforms into the new Audi A5, metaphorically becoming the 'beautiful' white swan. The soundtrack features Danny Kaye singing the children's classic Ugly Duckling. Changes to the Audi A5 Sportback include forced induction and direct injection on all engine models, standard start-stop-system; optional sport differential on the 3.0 TDI quattro and 3.0 TFSI quattro, optional MMI navigation plus. Changes to A5 Cabriolet include optional neck-level heating, special coating for optional leather seats. Early German A5 models include 1.8 TFSI (170PS) (Sportback/Coupé/Cabriolet), 2.0 TFSI (225PS) (Sportback/Coupé/Cabriolet), 2.0 TFSI quattro (225PS) (Sportback/Coupé/Cabriolet), 3.0 TFSI quattro (272PS) (Sportback/Coupé/Cabriolet), 2.0 TDI (150PS) (Sportback/Cabriolet), 2.0 TDI (177PS) (Sportback/Coupé/Cabriolet), 2.0 TDI quattro (177PS) (Sportback/Coupé/Cabriolet), 3.0 TDI (204PS) (Sportback/Coupé/Cabriolet), 3.0 TDI quattro (245PS) (Sportback/Coupé/Cabriolet), 3.0 TDI clean diesel quattro (245PS) (Sportback/Coupé/Cabriolet). It is a limited (300 units) version of Audi A5 Coupé for European market, celebrating the success of Audi works driver Mike Rockenfeller winning 2013 DTM season. It included a choice of four engines (2.0 TDI quattro (177PS), 3.0 TDI quattro (245PS), 2.0 TFSI quattro (225PS), 3.0 TFSI quattro (272PS), a choice of 3 body colours (Misano red, Daytona gray and Glacier white), DTM badges on the door sill trims, the fenders and the side sills; fixed rear wing in body color, exterior mirrors in aluminum look, twenty inch cast aluminum wheels in 5 V spoke design. The vehicle went on sale on 21 October 2013. Available in Sportback, Coupé, Cabriolet bodies, it includes 3.0 TFSI engine rated 333 PS (245 kW; 328 hp) and 440 N⋅m (325 ft⋅lbf), seven-speed S tronic transmission, S sport suspension, electronically controlled shock absorbers, dynamic steering, optional Audi drive select, 18-inch aluminum wheels. Available in Coupé and Cabriolet bodies, it is a version of A5 with 4.2 FSI engine rated at 450 PS (331 kW; 444 hp) and 500 N⋅m (369 ft⋅lbf), seven-speed S tronic transmission, quattro permanent all-wheel drive system with crown-gear center differential and torque vectoring (optional quattro with sport differential rear axle), 20 mm (0.79 in) lower body, electromechanical power steering, exclusive 19-inch forged alloy wheels, optional carbon fiber-ceramic brake discs, Audi drive select dynamics system, optional RS sport suspension with Dynamic Ride Control (DRC). Audi had problems with the oil consumption in the engines of the models between the years 2009 to 2011. More than 200 car owners in Switzerland were affected as well. In Switzerland, cars with less than 100,000 kilometres (62,000 mi) and below five years old can have the hardware replaced and paid for by Audi. If the car is between 100,000 and 200,000 kilometres (62,000 and 124,000 mi) and below five years, Audi fully pays the hardware but only half of the work. The all-new Audi A5 and S5 Coupé, based on the ninth generation of the Volkswagen Group MLB Platform, were unveiled in June 2016. Two gasoline and two diesel engines are offered for the A5. They are 2.0 litre TFSI with either 190 PS (140 kW) or 252 PS (185 kW), and the diesel motors are 2.0 TDI and 3.0 TDI, between 190 PS (140 kW) and 286 PS (210 kW). All the 2.0-litre powerplants can be paired with 6-speed manual gearbox (in certain countries only), or 7/8-speed S Tronic/Tiptronic which is standard on the 3.0 TDI. The notable feature on the Audi's latest coupé is the Virtual Cockpit instrument panel. Factory option for the A5 is S line package which consists of a sportier front bumper with an aluminum line, diffuser on the rear bumper, and S line badges on the front fenders. The 4 door Sportback model Audi A5 and S5 Sportback were released in September 2016 as a 2017 model. They are powered by the same engines as the A5 and S5 Coupé respectively. The Audi S5 is propelled by a turbocharged 3.0-litre engine worked with an 8-speed automatic transmission. Inside the S5 has standard front bucket seats with diamond-shaped stitching, and a flat-bottom steering wheel with S badging. The RS5 features standard RS sport rear differential, RS sport suspension, or optional Dynamic Ride Control which is an adjustable damping control to reduce pitching and body roll. Other options are carbon fiber engine cover, ceramic front brakes, and 174 mph top speed limiter. The Sportback version of the RS5 was unveiled at the 2018 New York Auto Show. ^ "High tech all the way – the new Audi A4 and A4 Avant". Audi MediaCenter. Retrieved 16 April 2018. ^ Hubbard, C J. "New Audi A5 and S5 revealed: more space, tech and power". CAR Magazine. Bauer Consumer Media Ltd. Retrieved 2 June 2016. ^ Gallina, Eric (16 June 2009). "Who's Where: Satoshi Wada to open independent design studio". Car Design News. Retrieved 11 December 2013. ^ "My Opera is now closed - Opera Software". myopera.com. Archived from the original on 2013-10-16. ^ a b "2008 Audi A5 and S5 Specs". JB car pages. Retrieved 2008-10-28. ^ "First Look: Audi A5 and S5 Debut at Geneva". Audiworld.com. Retrieved 2010-10-20. ^ "Elegance and Dynamism: The New Audi A5 / Audi S5". Audiworld.com. Archived from the original on 6 October 2010. Retrieved 2010-10-20. ^ "The Audi A5: At-a-Glance". Audiworld.com. 2007-04-16. Retrieved 2010-10-20. ^ "Audi Announces U.S. Pricing for 2008 A5 and S5 Models". Audiworld.com. 2007-09-05. Retrieved 2010-10-20. ^ "Audi Canada Announces Pricing for All-New A5 Coupe". Audiworld.com. 2008-01-22. Archived from the original on 14 October 2010. Retrieved 2010-10-20. ^ "The Audi A5 / S5 Cabriolet - the Joy of Open-Top Driving". Audiworld.com. 2008-12-02. Retrieved 2010-10-20. ^ "Audi to build A5 convertible in-house, sources say". ^ "A5/S5 Cabriolet U.S. Debut at New York Auto Show". Audiworld.com. 2009-04-08. Archived from the original on 19 October 2010. Retrieved 2010-10-20. ^ "Audi Announces 2010 MY Pricing For S4 Sedan and A5/S5 Cabriolet". ^ "2011 Audi A5 Sportback - Spied". Car and Driver. Retrieved 2011-06-01. ^ "Audi S5 Sportback (2010) CAR review". Carmagazine.co.uk. 2010-08-31. Retrieved 2011-06-01. ^ "2010 Audi A5 Sportback". Caranddriver.com. July 2009. Retrieved 5 March 2013. ^ "John LeBlanc's Top 10 cars not sold in Canada". Wheels.ca. Archived from the original on 2011-07-06. Retrieved 2011-06-01. ^ "Audi of America introduces the all-new 2018 A5 and S5 Sportback models, available for the first time in the US spring 2017 - Audi USA". www.audiusa.com. Retrieved 16 April 2018. ^ "Europe Gets the New A5 Sportback". AudiSite.com. ^ "The new Audi A5 Sportback: As elegant as a coupe, as practical as an Avant". Audiworld.com. 2009-06-17. Retrieved 2010-10-20. ^ Abuelsamid, Sam (2009-07-15). "Officially Official: 2010 Audi A5 Sportback revealed, not coming Stateside". Autoblog.com. Retrieved 2010-10-20. ^ Gluckman, David (September 2011). "2013 Audi S5 3.0T Coupe First Drive". Caranddriver.com. Retrieved 5 March 2013. ^ Abuelsamid, Sam (2009-10-01). "Audi shows off lightweight aluminum/carbon fiber A5 prototype". Green.autoblog.com. Retrieved 2010-10-20. ^ Quiroga, Tony (August 2010). "2011 Audi RS5 vs. 2010 BMW M3, 2011 Cadillac CTS-V Comparison Tests - Page 2". Car and Driver. Retrieved 5 March 2013. ^ "Road Test: 2011 Audi RS5". Gtspirit.Com. 2011-02-20. Archived from the original on 11 July 2011. Retrieved 2011-06-01. ^ "2011 Audi RS5 - First Drive Review". Car and Driver. Retrieved 2011-09-17. ^ Niebuhr, Kurt (29 August 2012). "2013 Audi RS 5 Road Test". Insideline.com. Retrieved 5 March 2013. ^ "Geneva Motor Show: Audi RS 4 - The Sports Car for 365 Days a Year". Audi AG. VWvortex.com - Audi News. 1 March 2005. Archived from the original on 2011-07-16. Retrieved 14 September 2009. ^ Audi Communication (24 January 2015). "Audi MediaServices - Audi to present the RS 5 in Geneva". audi-mediaservices.com. ^ a b "Challenge Bibendum: Audi's E100-capable A5 can get to 25 mpg and 146 mph". Green.autoblog.com. 2010-06-25. Archived from the original on 2012-04-26. ^ Noah Joseph. "Audi releases special edition S5 on Facebook". Autoblog. ^ Carscoop Carscoop. "Audi Marks the End of the V8-Powered S5 Coupe with a Special Edition Model [Video]". Carscoops. ^ "Audi S5 4.2 Special Edition Marks Best-Yet V8-Powered S-coupe". fourtitude.com. ^ Lavrinc, Damon (2009-02-06). "Audi A4 and A5 get S tronic gearbox abroad, U.S. still waiting". Autoblog.com. Retrieved 2010-10-20. ^ Bowman, Zach (10 November 2011). "Audi discontinues manual gearbox for S4 and S5 in Europe, U.S. models safe". Autoblog.com. Retrieved 5 March 2013. ^ "Titanium Package for American Audi A4, S4, A5 and S5 Revealed". fourtitude.com. ^ "Audi A5 Coupe - Full Review". Whatcar.com. Archived from the original on 5 May 2009. Retrieved 2009-06-19. ^ "Review of Audi A5 Sportback 1,8 TFSI 2012". click2how.com. Archived from the original on 2015-05-11. Retrieved 2012-06-06. ^ Floraday, Phil (27 September 2011). "First Drive: 2013 Audi S5". Automobilemag.com. Retrieved 5 March 2013. ^ "Audi A5 3.0 TDI triumphs in the Challenge Bibendum". autoblog.com. 2007-11-27. Archived from the original on 2012-04-26. ^ "Audi updates A5 range for 2012; S5 coupe to ditch V8". Left lane News. 2011-09-14. ^ Ewing, Steven J. (13 July 2011). "2012 Audi A5, S5 get a nip/tuck". Autoblog.com. Retrieved 5 March 2013. ^ a b Steven J. Ewing. "2013 Audi RS5 officially priced from $68,900*". Autoblog. ^ Jeff Glucker. "Facelifted 2012 Audi RS5 breaks out before Frankfurt debut". Autoblog. ^ Venkat Desirazu. "2013 Audi RS 5 launched in India for Rs 96.81 lakh". Carwale.com. Retrieved 2 July 2013. ^ Winfield, Barry (September 3, 2012). "A Five for Fighting". Autoweek. 62 (18): 31–33. Retrieved September 14, 2012. ^ "Audi RS5 - Car and Driver". www.caranddriver.com. Retrieved 2016-07-26. ^ Steven J. Ewing. "Audi RS5 Cabriolet debuts in Paris, confirmed for U.S. in Q1 2013". Autoblog. ^ Audi Communication (24 January 2015). "Audi MediaServices - Premiere RS 5 Cabriolet". audi-mediaservices.com. ^ Zach Bowman. "Audi RS5 Cabriolet priced from $77,900*". Autoblog. ^ "Audi prepares to fend off BMW with new A5 DTM". autoblog.com. 2011-07-18. Retrieved 2011-07-18. ^ "Audi A5 DTM makes us long for tin-tops that can also turn right". autoblog.com. 2011-09-15. ^ "Ad of the Day: Audi". AdWeek. ^ Audi Communication (24 January 2015). 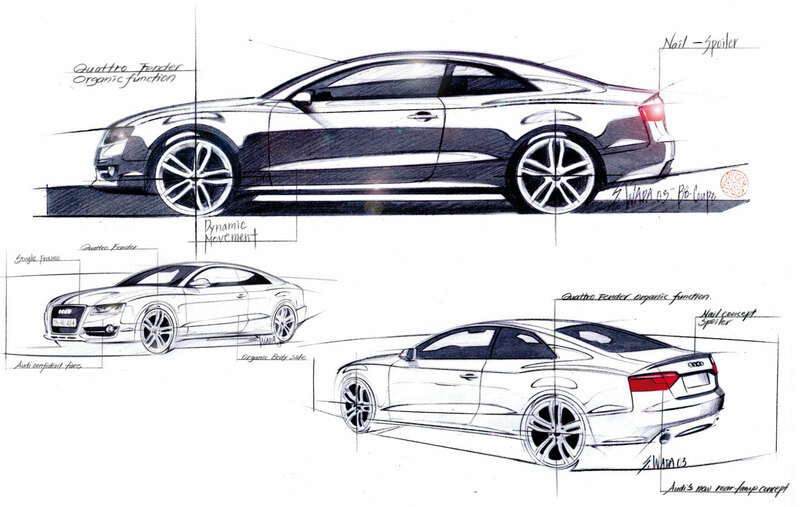 "Audi MediaServices - Audi A5 Sportback, A5 Coupé and A5 Cabriolet". audi-mediaservices.com. Archived from the original on 2015-01-28. ^ Noah Joseph. "Audi reveals special A5 DTM Champion edition". Autoblog. ^ Super Highlight. "2017 New Audi RS5 on review". atvmagblog. Wikimedia Commons has media related to Audi A5.